The State Coat o Airms o Ukraine (Ukrainian: Державний Герб України) or commonly the Tryzub (Ukrainian: Тризуб, "trident") is the naitional coat o airms o Ukraine, featurin the same colors foond on the Ukrainian banner; a blue shield wi yellae trident, cried the tryzub. It appears on the Presidential staundart o Ukraine. The sma coat o airms wis offeecially adoptit on 19 Februar 1992, while constitutional provisions exist for establishin the great coat o airms, which is no yet offeecially adoptit. 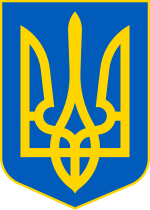 Wikimedia Commons haes media relatit tae Coats of arms of Ukraine. This page wis last eeditit on 14 Mey 2018, at 15:41.